In a Downing Street meeting on Thursday, Apple CEO Tim Cook and U.K. Prime Minister Theresa May discussed a variety of topics, including local Apple investments and May's plans to withdraw her country from the European Union following a 2016 referendum [updated with more info on Cook's UK visit]. 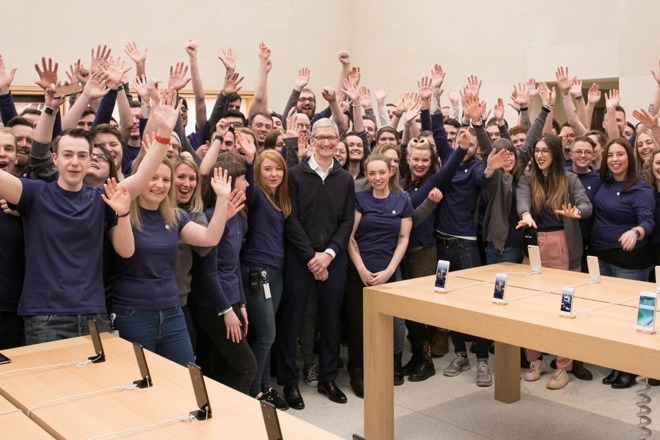 Tim Cook at Apple Buchanan Street this week. The meeting was a "very positive and useful discussion," according to a statement from the Prime Minister's office obtained by Business Insider's James Cook. The technology editor said he personally spotted Cook arriving at Downing Street, where the Prime Minister is based. The statement didn't elaborate on what it meant by Apple making "a recent announcement about their investment in the U.K.," but that presumably refers to the company's plans to open a new British headquarters inside London's former Battersea Power Station. The facility should reopen in 2021, consolidating various Apple offices scattered around the city. Another topic was "the importance of government and business on digital skills," which the Prime Minister's office said will "clearly be a huge part of the future industry." The Brexit discussion may have arisen due to concerns about how it will affect both Apple profits and operations. Beyond economics, it could also impact things like the company's ability to shift workers around Europe. Cook believes the UK will be "just fine" after an exit from the EU, Reuters said citing a BBC report. Update: Cook separately met with the mayor of London, Sadiq Khan, according to official Twitter posts. Khan noted that the pair talked about "talent, digital skills & Apple's investment in London." Elsewhere in the city Cook visited Woodberry Down Primary School, likely promoting the company's involvement in education through apps like Classroom and iTunes U, plus support and distribution deals for Macs and iPads. Cook has been touring the region the entirety of this week, beginning his trip in France, where he visited Apple stores and other locales. He then traveled to Germany, and on Wednesday made it to Scotland for an honorary degree.